Cranes are members of the “Gruidae” family – a very ancient bird family that has been around for about 40 million years. Despite having characteristics of the heron and stork families, cranes are actually unrelated to these birds and are much more closely related to Moorhens and Coots. There are 15 species of cranes across the world and they are found in every continent except Antarctica and South America. The cranes being released by the project are the Eurasian or Common Crane and one of the most widespread on the continent – but they are anything but common birds. Their behaviour, their calls, their appearance, the way they are revered around the world, their dancing, their history – everything about them is fascinating. To find out how you can champion one of these amazing birds and be a part of their future visit the Crane Champions pages. To discover more about their incredible lives – visit the Crane Life and Crane History pages. 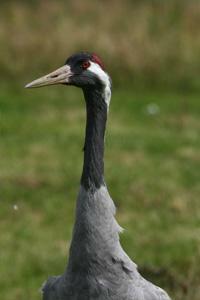 And to meet the very birds that that have been released, go to the Meet the Cranes pages. How do you tell a crane from a heron? 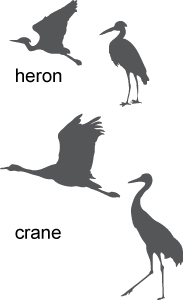 Both herons and cranes are big grey birds, but there are some very distinct differences. The heron flies with its neck bent and head tucked in so appears short necked, with long trailing legs. The crane flies with neck outstretched like a goose and but also trails its long legs behind. The pattern of flight is similar in both species, but Herons are very often solitary. Unlike herons the cranes go around as a little gang – and fly in a typical line formation, one behind the other, similar to a flock of geese. Cranes are very unlikely to be standing still, and hunched beside pools, or ditches. This is heron behaviour. Cranes are more likely to be heads down as a group picking over arable stubble, or in pasture land. Presently the young cranes are very grey and brown looking. In contrast, herons actually have a lot of white on their bodies, and can look very pale or even white when viewed head on. As the young cranes mature, they will develop the distinctive white and black patterning on their heads and necks but their wings and bodies become a more uniform light grey.